In the Wizarding World, just about everything you run across is magic or magicked in some way. Sometimes, it can be tough to decide which one is which, though. If it talks, there's a good chance that it is a creature. But, there are exceptions where the thing is just a charmed object or a particularly conversational spell. So, it makes us all particularly curious about the seemingly sentient nature of the balls that go flying around in a Quidditch match. Is this merely a force of magic going all over the place or does that Snitch have some ideas of its own? The only way a Muggle can know anything about the Wizarding World is through careful observation. 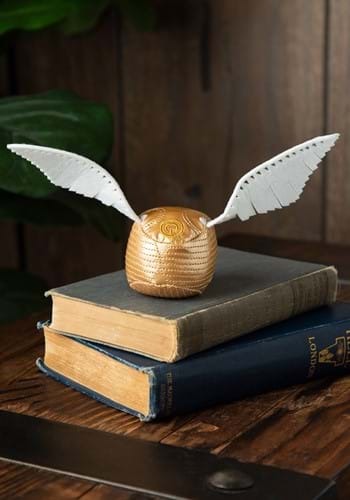 So, keep an eye and occasional hand on this Harry Potter SWAT Golden Snitch and learn all of its secrets. This soft-sculpted ball has 4-inch wings sewn to the side and gives delightful sounds whenever you grab it. Perhaps, in time, you can learn what it has to say! BE IT A SPELL OR A WEIRD LITTLE BUG?